To earn your CSM certificate you must attend an in-person, two-day (16 hour) CSM course taught by a Scrum Alliance Authorized Trainer. After successfully completing the course, you will be registered with Scrum Alliance and need to pass the online CSM exam. You can choose the exam language before getting started. The CSM test is available to be taken in English, Spanish (Castilian), Portuguese, French, Italian, German, Japanese, Simplified Chinese, Danish, Czech, and Russian. Students are able to take the test online from any computer in the world from the comfort of their home, work, or other location. The test will not be proctored. After receiving the initial welcome email from Scrum Alliance that contains the account activation link, you will have 90 days to complete the CSM test for free. Students are also given two free attempts to pass the CSM test. If you fail the test twice or complete it after 90 days, you will be prompted to pay a $25 USD test attempt fee. After you pass the CSM exam, you will be asked to accept the License Agreement and complete your Scrum Alliance membership profile. The certification is valid for two years. For the renewal of your CSM certificate, you need 20 SEUs and pay a fee of 100 $. You will be contacted by Scrum Alliance and reminded in due time. 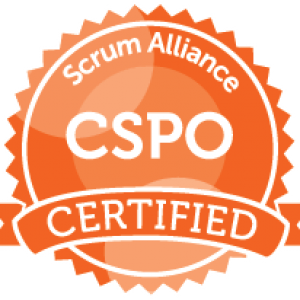 To earn your CSPO certificate you must attend an in-person, two-day (16 hour) CSPO course taught by a Scrum Alliance Authorized Trainer. After successfully completing the course, you will be registered with Scrum Alliance and will be asked to accept the License Agreement and complete your Scrum Alliance membership profile. There is no certification exam. The certification is valid for two years. For the renewal of your CSPO certificate, you need 20 SEUs and pay a fee of 100 $.